I needed to make a thank you gift today. I didn’t feel like baking. CHOCOLATE DIPPED MARSHMALLOWS TO THE RESCUE!!! These are super-duper easy and pretty fast, if you use the microwave and have everything already on hand. I grabbed some yellow candy melts outta the freezer, dropped them into a coffee mug, shoved them into the microwave and actually READ the directions on the back of the bag this time. Half Power, :30 at a time = melted choc. I opened a bag of marshmallows (I seem to have like a million bags in the pantry. Sheesh. ), poked them with some leftover skewers, and then plunked them one at a time in the melted goo in the coffee mug. You spoon the candy over the marshmallow until it’s covered, then whack the marshmallow a few times on the side of the mug til all the excess drops off. You stand the marshmallow up on a piece of tin-foil and let it cool for a few seconds/minutes – you know, until you realize you’ve forgotten to add the sprinkles. Then you quick quick roll them in sprinkles and stand them back up to dry. If you’re my husband you think they’re dry in 2 minutes flat, but I like them a little harder, so I wait like…5. Maybe 10. I’ve been attracted to addicted to Michael Psilakis’ cooking for years now. YEARS. The man is a genius in the kitchen. For our wedding I asked for his cookbook. Out of pure laziness I let the cookbook sit on my shelf for a very very long time. Last week I pulled it out looking for something, I forget what. I got to read Mr. Psilakis’ story and ooh and aah over his food photos and then I put the book back down. This morning I woke up and decided it’s time to start actually USING the cookbook. So today I made Garlic Confit. I’m hungry just smelling the awesomeness that is braised Garlic. You dump a bunch of peeled garlic (about 3 cups) into a heavy bottomed pot that has a lid. You add in lots of thyme, a few bay leaves, a dozen or so whole peppercorns and then barely cover the whole thing with oil (I used Canola). You bake it at 300 for 1-1.5 hours, until the garlic looks brownish and is soft to the touch, and then let it cool. You’re supposed to transfer the garlic & oil to an airtight jar and you can use it for weeks (just follow the directions on proper maintenance). I may lick the pot. 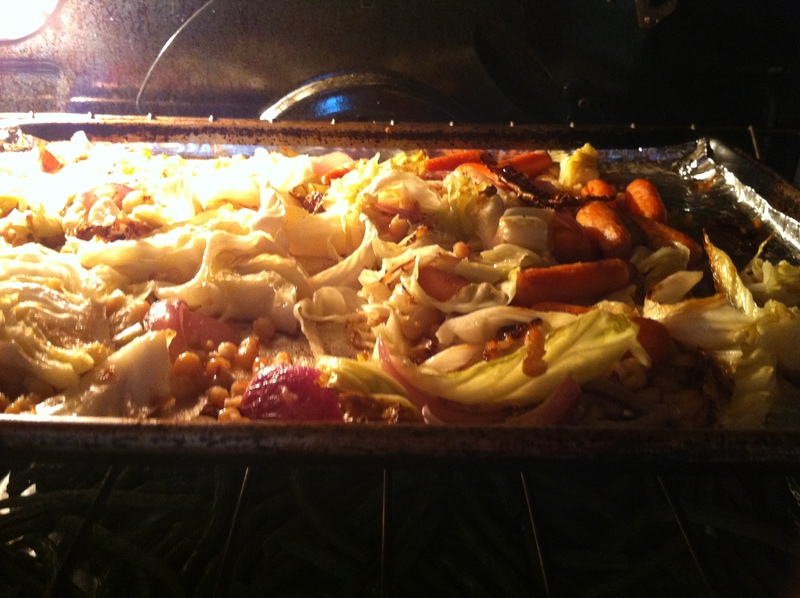 Since the oven was already on, I decided to go ahead and roast some other veg for lunch. 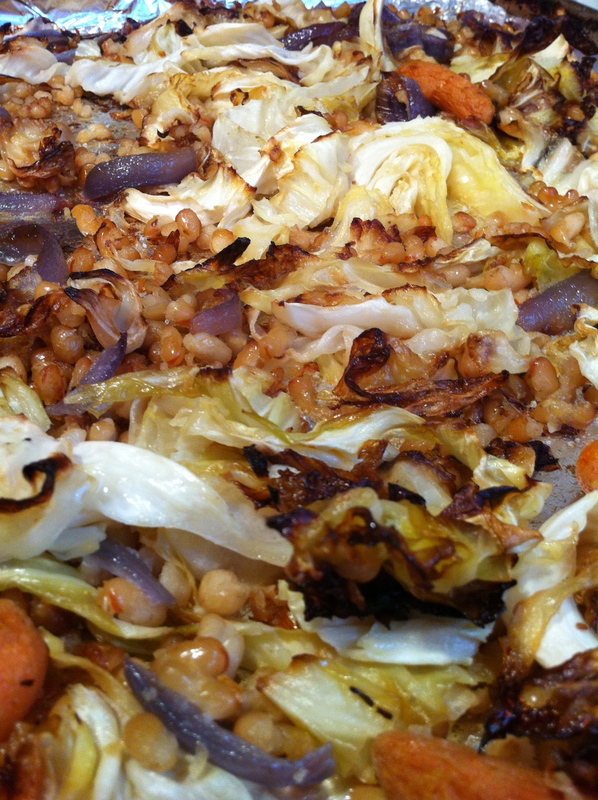 I had half a head of cabbage, half a bag of baby carrots, a red onion and a can of small white beans. Oil + veg + oven + sprinkle of sea salt = LUNCH! Have I mentioned my MOST FAVORITE SANDWICH IN THE WHOLE WIDE WORLD? I had a bag of green beans in the fridge as well, the oven was already on – so AWAY WE GO! 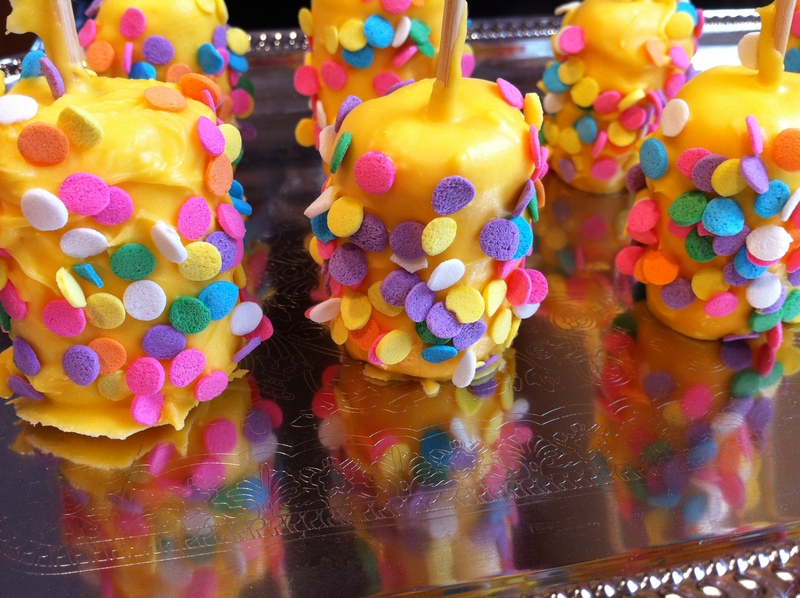 1 cup Candy Melts or Chocolate Chips **Feel free to use as much as you’d like! This is a good place to start though. 2- Either use a double boiler or the microwave to melt your chocolates/candy melts. Lately I’ve been using the micro-slave to nuke the candy melts; Use half power and do the melting in short spurts (like a :30 or a minute at a time. Stir frequently. When the stuff is all melty and drippy, you’re ready. 3- Dip your marshmallows in your mug o’ chocolate. Use a spoon or a fork to help coat the marshmallow. Tap the stick on the side of the mug a few times, to help the excess drop off. Stand the marshmallow up on the foil and grab your next one. If you don’t operate fast enough the chocolate will cool and you’ll need to reheat – again, make sure it’s on half power! OF COURSE, if you’re using a double boiler – don’t bother. It’ll still be awesomely melty. 4- If you want to you can double dip the marshmallow treat. You can also dip the marshmallow into sprinkles before it hardens. That’s all sorts of happy fun. 2- Put the garlic cloves in a heavy, covered braising pan or Dutch oven. Add the bay leaf and thyme, a scant tablespoon kosher salt, and 15 or 20 black peppercorns. Barely cover with the oil. 3- Cover the pan and braise in a 300°F oven until the cloves are pale golden and very tender, about 1 hour to 1 hour and 15 minutes. Cool it to room temperature. 4- Transfer the garlic and all of the oil to a sterilized jar (**I use the dishwasher to clean an old sauce jar or olives or whatever). Press a square of plastic wrap down directly onto the surface of the oil. Place another square of plastic over the rim of the jar and twist on the lid or secure with a rubber band. With every use, replace the square of plastic that touches the oil and use a perfectly clean fork or tongs each time to prevent cross-contamination from other surfaces in your kitchen. As long as the cloves and Garlic Purée,are covered with oil, they will last for at least 3 weeks in the refrigerator. 1- Line a baking sheet with foil. Heat oven to 425ºF. 2- Lay out the veg and drizzle with the garlic confit. Toss and turn to coat. Sprinkle with salt & pepper and whack that pan into the oven. 3- Every 10-15 minutes, use a spatula or a spoon to scrape everything up and toss it around. Roast for about 30-40 minutes, until everything smells delicious and looks all crispy and happy. Enjoy! 1 lb. Green Beans, washed and trimmed. 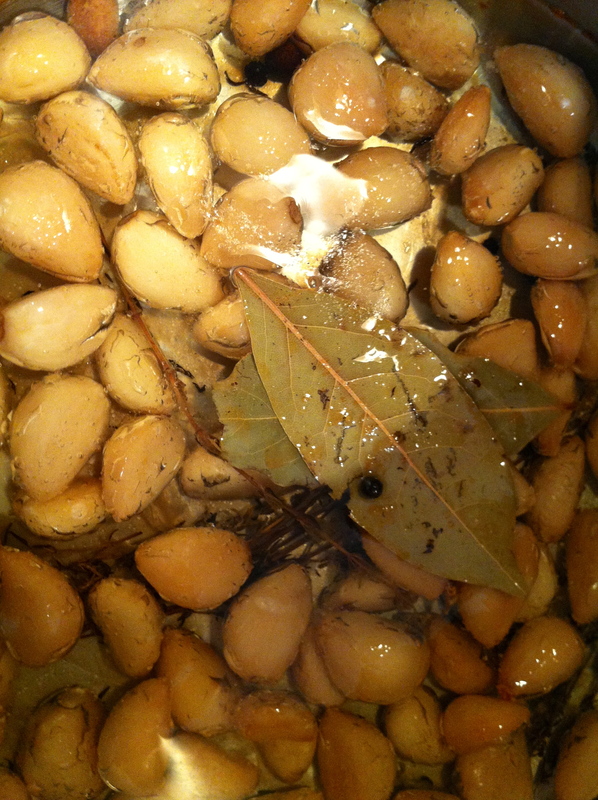 1- Toss the beans in the garlic confit and then roast them at 425ºF (on a lined baking sheet) for about 30 minutes. Let them cool while you slice open the baguette, slather each side with cream cheese and then drizzle with Sriracha. 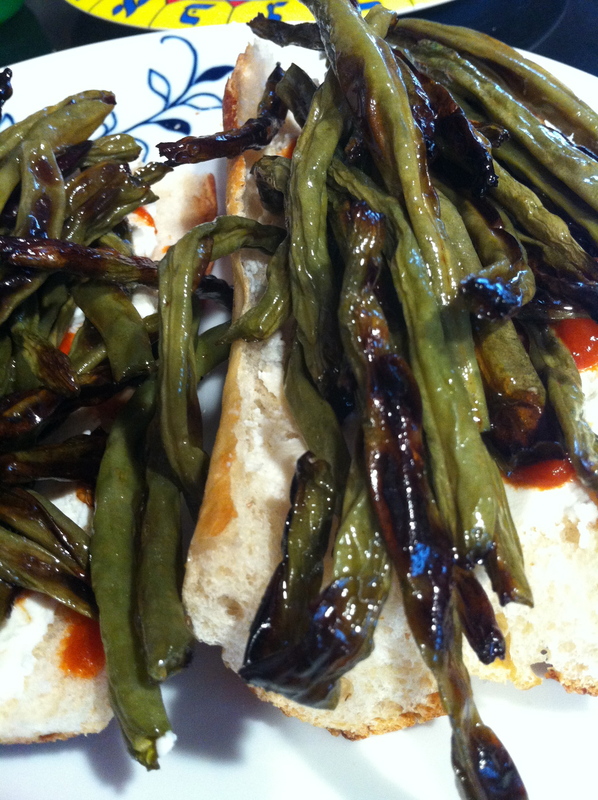 Top each half with your roasted green beans. 2- TRY not to clap for joy.